I sometimes wonder regarding bands that are sadly no more, but clearly were at the absolute pinnacle of their particular pile of hairy guitar slingers, whether people truly realised at the time what they were watching. Now it becomes clear, after a couple of decades of people vainly trying to come up with death metal that sounds anywhere near as elegant, effortlessly brutal or musical as what Chuck and his pals fashioned throughout the 80s and into the 90s, before his tragic end, that they really were the masters of their craft – the Mozart to Entombed’s Beethoven perhaps. There’s something particular about the way Chuck sung, living on in live late-period glory on this two-CD release, that elevated them about the grunters, from Benton to Petrov (excluding Obituary’s Tardy, who I have to mention just because he reinvented vocals like John Carpenter reinvented horror). Mr Schuldiner had a slightly off-hand, yet focused, and precisely articulated growl which allowed the lyrics (often underappreciated for their intelligence perhaps) to come through clearly, while playing off his immaculate guitar lines like some sort of dark ballet. There are two live sets in this ‘deluxe’ package, both of which reignite your love for this kind of music in general, and this band of pioneers in particular, if you had begun to think it was a stale genre. And hopefully rather than just pining for the golden era for metal that was the late 80s, it can inspire you to enjoy Death’s metal even more. The first set, from a Hollywood gig in 1998 is for me the stronger of the two, the sound quality possible with an indoor show compressing the band into an astonishingly powerful force which hits you straight between the ears. It’s a realistic sounding, warm mix, meaning far-out later tracks like Spirit Crusher and Flesh and the Power it Holds turn into involving odysseys that are a pleasure to listen to, while bangers like Pull the Plug and Symbolic just level the place, leaving the crowd baying for more. It’s pretty heart-wrenching to hear how genuinely chuffed Chuck sounds with the audience reception in his between-song banter, little knowing that he’d be dead within three years from a brain tumour. The second set suffers by comparison, being an open-air festival gig (in Eindhoven, also in 1998), and having some sort of weird slap-back echo occurring within the sound mix. However it’s equally brilliant in terms of the performance, though sadly doesn’t come across as powerfully, especially given some of the same songs as the Hollywood set are aired, unsurprisingly. Anyway sound gripes aside, this is absolutely essential, for anyone just wanting to experience how fulfilling and even uplifting death metal can be in musical terms, shown in glorious live versions by an utterly flawless unit. Chuck lives on, in Vivus! Ten out of ten. 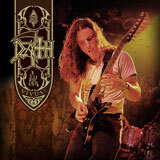 2012, CD, Chuck Schuldiner, Death, Death Metal, James Parker, Live, Relapse Records, Review, Tech Death, Vivus!